M n Yoga, what you do and how you do it are equally important, and both mind and body contribute to your actions. Yoga respects the fact that you aren't merely a physical body but a psychophysical body-mind. Full mental participation in even the simplest of physical exercise enables you to tap into your deeper potential as a human being. 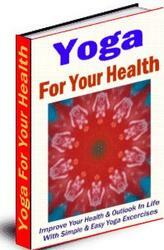 This chapter is about cultivating the right attitude toward your Yoga practice, which is the best preparation for success in Yoga. We encourage you to find your own pace without pushing yourself and risking injury, and to leave your competitive spirit to other endeavors. We also emphasize function over form, proposing that a modified version of the "ideal form" of a posture that suits your needs is the right form for you. Yoga is a creative endeavor that asks you to call upon the powers of your own mind as you explore and enjoy the possibilities.